I constantly hear Americans and American politicians talking about how innovative the USA is. America is the home of “the free market”. This is something that Americans are incredibly proud of and a major reason that they site for the economic success of the USA. Yet I predict that this very same fee market is paradoxically going to be the cause a major economic decline in the USA. This economic decline is already evident and has been occurring for some time now. However this trend was hidden by a ponzi scheme driven by cheap debt, low interest rates and lax lending standards combined with shonky Government economic Statistics. While real wages from employment were falling for the majority of Americans, households were bolstering their income with imaginary profits from unrealised gains in house prices . 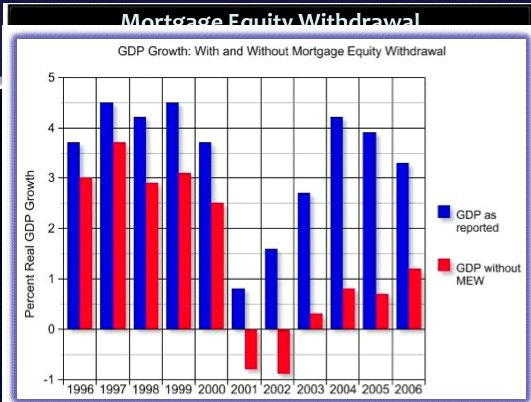 At one point almost 8% of annual USA GDP was coming from equity withdrawals predicated on unrealised profits from the housing boom. What most people forget about capitalism and the free market is that it is based on competition between companies and not countries. Companies have no loyalty to countries. If companies want to survive in a global market place against global competitors they need to think and act globally. This is why manufacturing has been in decline in the USA and other parts of the developed world and why it is now taking place in places where labour costs are lowest – all other costs considered. So far it has really only been blue collared jobs that have gone off-shore. The American’s feel that the highly skilled engineering jobs that have maintained their global leadership edge in new product innovation are safe. It is assumed that these high paid jobs will stay in the USA and countries like China and India will get the low skilled and low paid jobs. This is a delusion. High-tech R&D is starting to shift out of the USA to China. Moreover this shift is set to continue and accelerate – competition and the free-market will drive it now that it has started. Take a look at the city of Xian, located about 1000 km south west of Beijing. According to a New York Times article titled China draws high-tech researcher from the USA it has 47 universities and other institutions of higher learning. Engineers with masters degrees can be hired for $730 per month. And the result is that Applied Materials, one of Silicon Valley’s most prominent firms and the worlds biggest supplier of equipment used to make semiconductors, solar panels and flat-screen displays, has just built its newest and largest research lab in Xian. And, in addition, Mark Pinto, The chief technology officer of the company has relocated to China too. How can the USA compete? It cant. Thanks to the free-market almost 20 cents in every dollar in the US economy is spent on health. And when high health care costs are added to high house costs it is easy to see why someone on $760 a month in the USA would starve. And besides, with the cost of a 4 year University degrees in the USA as high as $200,000, big salaries are required to justify this sort of cost. Moreover this is just the price of an undergraduate degree and apparently reflects only half the cost of delivering it. The reality is that in a globalised free-market expensive health care and expensive houses translates into wage needs that are globally uncompetitive. And there are other reasons why the USA will find it difficult to compete against the likes of China – the free-market mindset is reluctant to see the government get involved in the market in any way. This doesn’t work when governments in other countries act differently. For example, Western companies relocating to China not only get local access to the worlds largest Auto, and desk top computer markets and cheap highly skilled labour – they are often also offered subsidies by many Chinese cities and regions, particularly for green energy projects. For example, in the case of the new Applied Materials Lab, the Xian city government sold a 75-year land lease to the company at a deep discount and is reimbursing the company for roughly a quarter of the lab complex’s operating costs for five years. President Obama and American politicians talk about creating new Green Tech jobs in the USA but this is likely to be a pipe dream. Even if he could muster the political will to stand up to the Republican free-market right the competitive playing field is tilted against the USA. The bitter irony is that the free-market is and has destroyed its inventor and greatest proponent. Even more surprising is that these proponents don’t seem to be able to either see this or understand it. The same is true for democracy – it is a system that holds in it its own seeds of destruction. I will leave that for another day.